This new introduction to Chaucer has been radically rewritten since the previous edition which was published in 1984. The book is a controversial and modern restatement of some of the traditional views on Chaucer, and seeks to present a rounded introduction to his life, cultural setting and works. Professor Brewer takes into account recent literary criticism, both challenging new ideas and using them in his analysis of Chaucer's work. Above all, there is a strong emphasis on leading the reader to understand and enjoy the poetry and prose, and to try to understand Chaucer's values which are often seen to oppose modern principles. 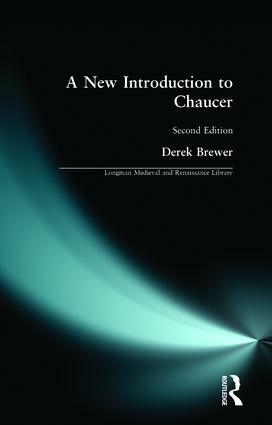 A New Introduction to Chaucer is the result of Derek Brewer's distinguished career spanning fifty years of research and study of Chaucer and contemporary scholarship and criticism. New interpretations of many of the poems are presented including a detailed account of the Book of the Duchess. Derek Brewer's fresh and narrative style of writing will appeal to all who are interested in Chaucer, from sixth-form and undergraduate students who are new to Chaucer's work through to more advanced students and lecturers.